Make the pasta and reserve ½ cup hot pasta water. Add 2 tablespoons of olive oil to the pasta water. Drain the remainder of the pasta and set aside. Using a sharp knife, cut approximately ½ inch off of the top of the head of garlic, exposing the cloves. Place the garlic on a microwave safe dish and drizzle the remaining 1 tablespoon of olive oil over the top of the exposed garlic cloves. Cover the garlic with a paper towel and microwave for 2 minutes in 1 minute intervals. Let the garlic cool and then pop the cloves out of the skins (for more flavor, you can cook the softened garlic in a small skillet for just 1 minute or 2 on medium-high heat until golden-brown). Do not burn the garlic. Finely chop the garlic. Make the dressing. In a medium bowl, combine the ricotta, garlic, parmesan cheese, the pasta water with olive oil, lemon juice, salt, and pepper. Stir or whisk to combine thoroughly. 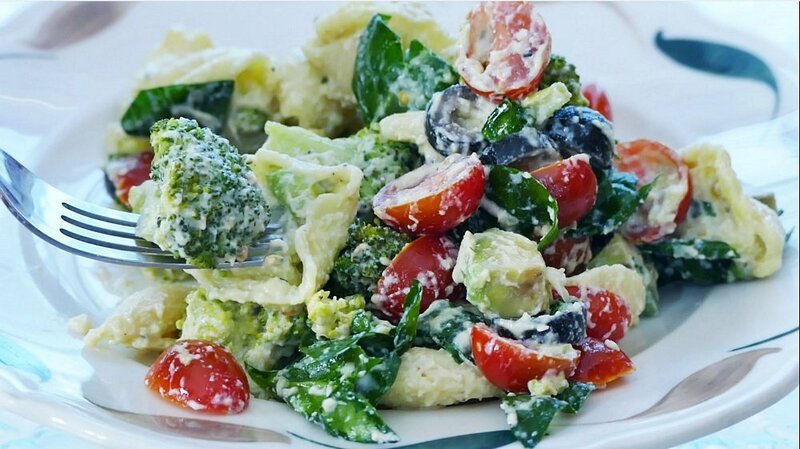 In a large bowl, add pasta, tomatoes, spinach, avocado, broccoli, olives, parsley, and ¼ cup parmesan cheese. Pour the dressing over the top and gently stir to combine. Best served immediately. Flavors will diminish when refrigerated. It may be necessary to add a little more salt, pepper, and a dash of olive oil stirred in to bring flavors back up.